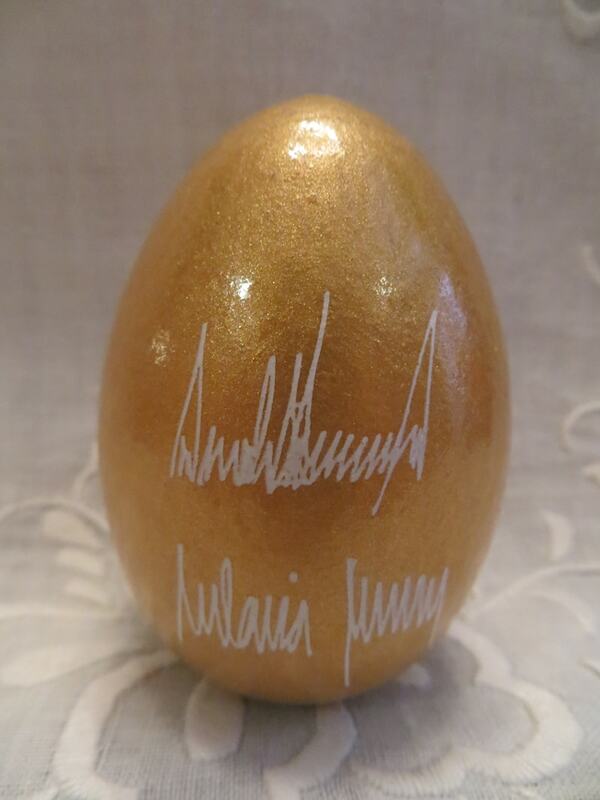 2019 Official White House Easter Egg GOLD. 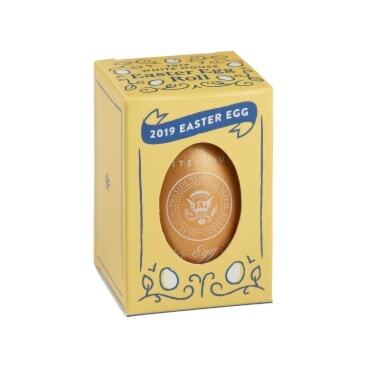 The Official 2019 White House Wooden Easter Eggs are red, green, and blue inspired by the State Rooms, rose for the Rose Garden and gold inspired by the Vermeil Room. On the front is an image of the South Portico of the White House and the year. On the back appears the printed signatures of Donald Trump and Melania Trump. The eggs have become a lovely Easter Keepsake. 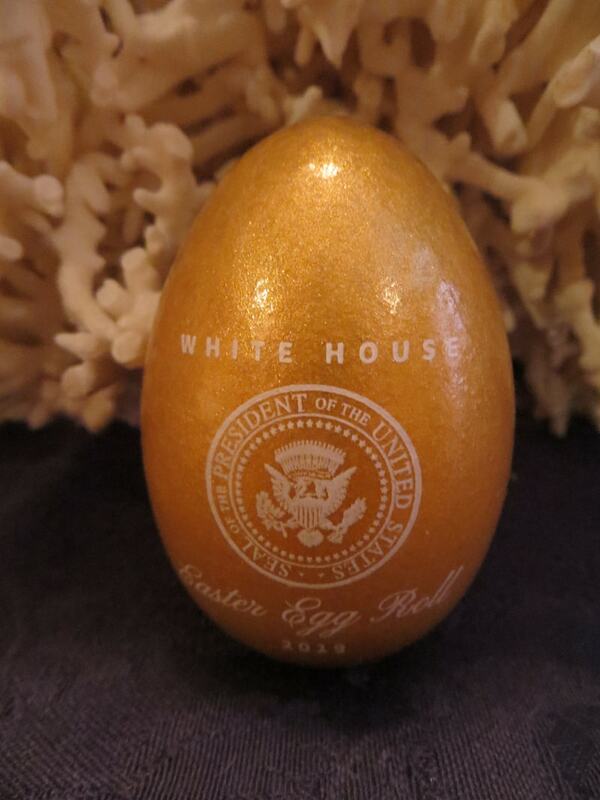 The five souvenir eggs are crafted from FSC-certified U.S. hardwood and arrive in a yellow gift box. Made in the USA by Wells Wood Turning and Finishing. On Easter Monday, April 22, 2019, President Donald Trump and First Lady Melania Trump will host the annual Easter Egg Roll on the South Lawn of the White House. 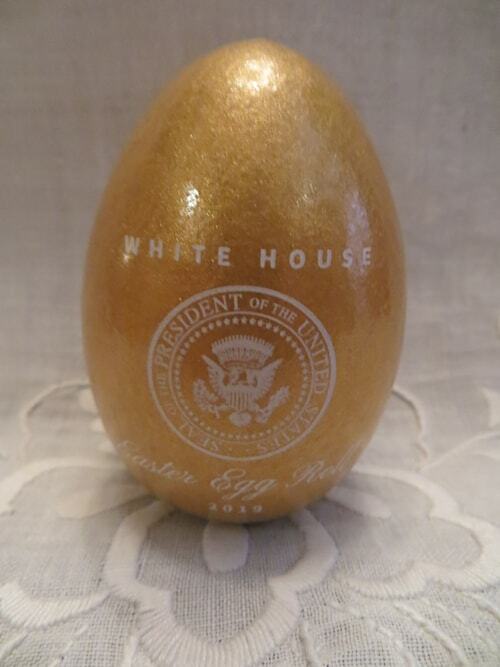 The White House Easter Egg Roll is an annual tradition dating back to 1878 under the Administration of President Rutherford B. Hayes who hosted the first annual White House Easter Egg Roll exactly 141 years ago on White House grounds for children who wanted to roll Easter eggs. In 1885, indoor egg roll receptions became customary under President Grover Cleveland. President Benjamin Harrison ordered the Marine Band to play lively music while the children played on the South Lawn.